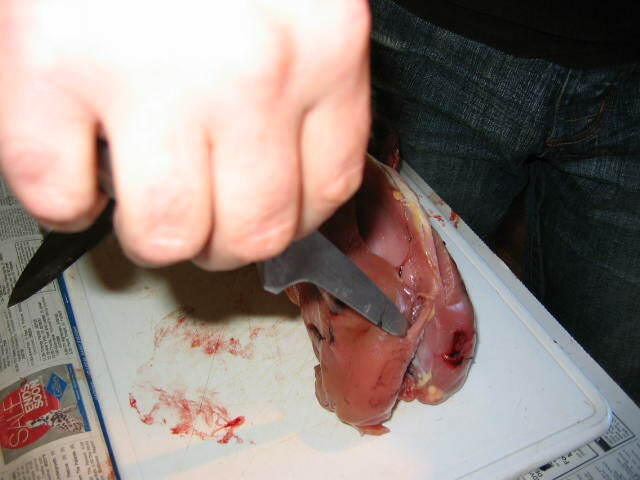 This is generally a basic idea of "HOW TO" prepare your hard earned meat. 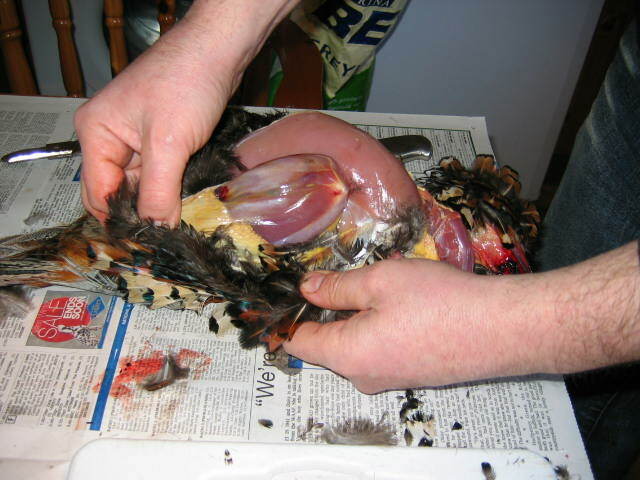 You can either pluck or skin the bird first,but the idea is the same. 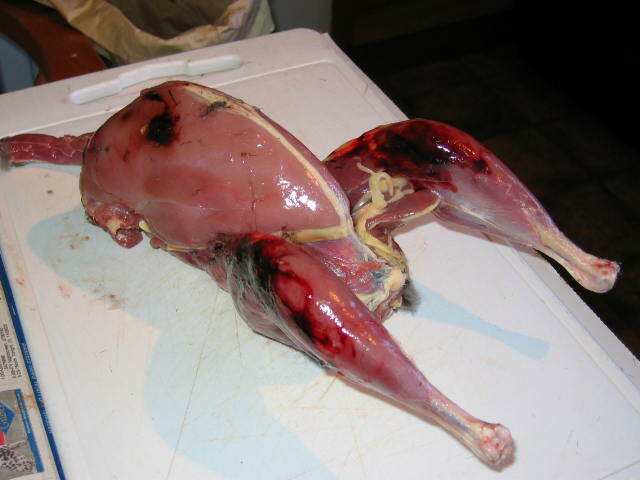 I haven`t cut as much of the meat off the bones as I possibly could have for 2 reasons,firstly for anyone starting out on their first bird it would have been daunting to have removed the "supremes" or the "oysters" and also because I like to make stock as this is the keystone to TASTE. WARNING - for those who are squeamish it contains blood guts and gore. First the basics - If you wish to stay with your nearest and dearest,cover the surface you are working on with several sheets of newspaper.Use a chopping board & SHARP knives.Have a bin or bag ready and open,I use old dog food sacks as I feel they are better when doing a load of birds. Choose(if possible)a bird that is not too broken and try and get a young one for roasting/frying,or any other fast cooking method.Older birds need a slower method like casseroling or braising. The bird on the L is old & on the right young. Remove the feet at the joint,feel for the gap and apply pressure.It should go through easily,if not flex the joint and you will see where to cut. I use these curved scissors(ex-P.O. )but a solid sharp knife will easily do it,but remember to use the chopping board. 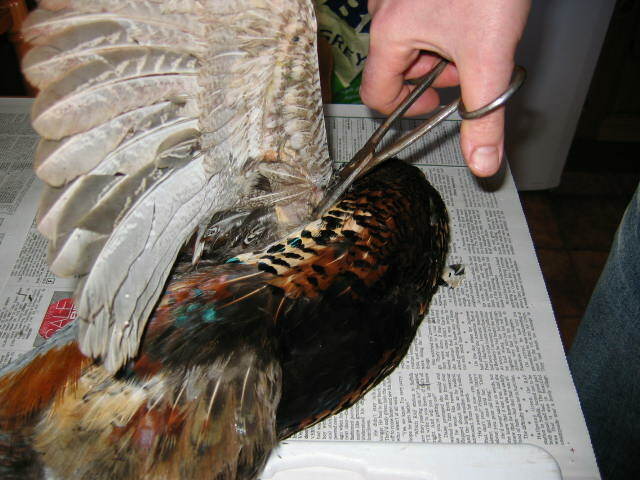 Cut the head off as close as possible,then cut the wings off as there is little meat on any bird smaller than a greylag.Not too far away from the shoulder. Feel for the breastbone and nick the skin.Now go over to the bin/bag to save you from a divorce & pull the skin apart over the breast stopping at the shoulders and then pull the skin over the neckgrabbing the crop and windpipe as you do so. Then ease the skin off the shoulders & down the back. 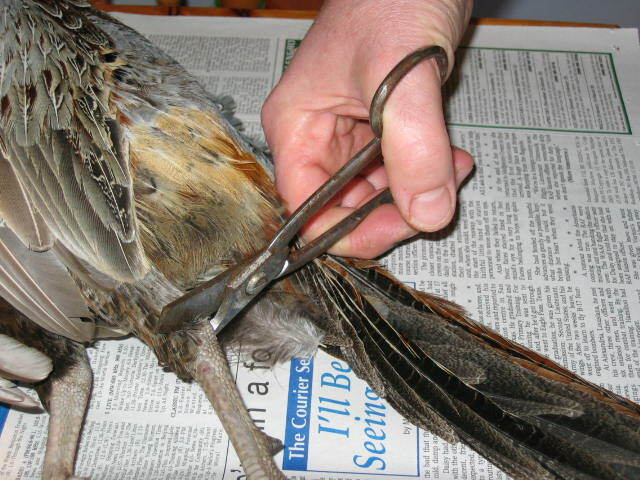 If the leg joints are smooth(if you didn`t splinter the bone)place your index finger on the end and apply pressure whilst pulling the skin towards the tail,the skin will come off like a pair of pants.Do this both sides and pull the skin back to the parsons nose and stop. 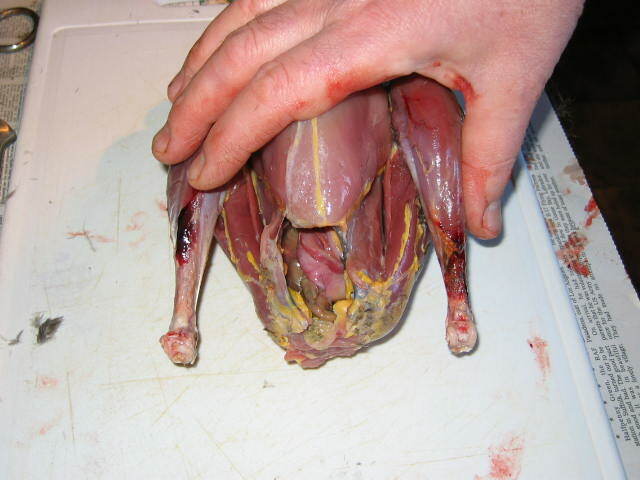 You should now have a skinned bird,or if you have chosen to pluck,it will look similar.Make a slit like in the photo,and insert your index and middle fingerskeeping them pressed firmly up against the inside of the breastbone. You will feel a hard lump,the heart,let this slip between your fingers and grasp firmly pulling down firmly to the backbone,curve your fingers and pull back slowly removing the whole of the digestive tract. If its smaller than a hen phessy use a teaspoon to do it. 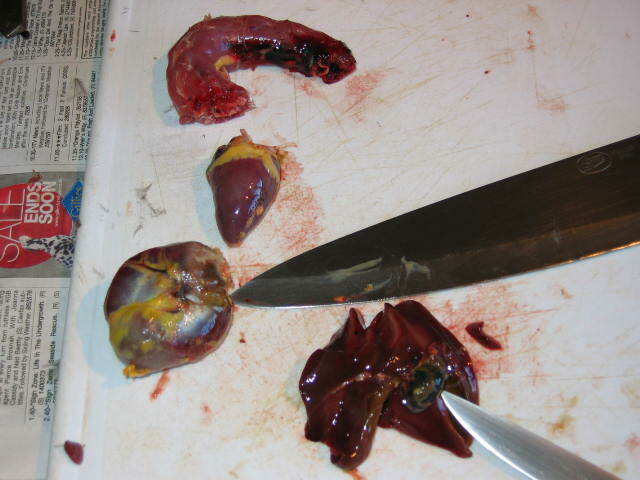 Then look into the cavity and you will see 2 redish pink organs near the spine,these are the lungs and a teaspoon is the best tool to remove these. This is how the innards should come out,in one piece. 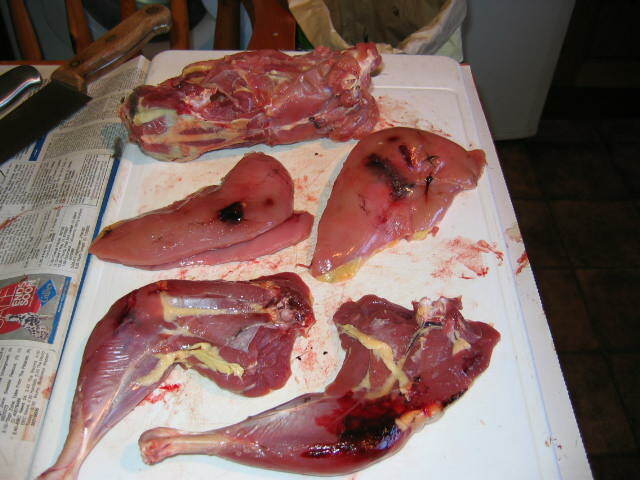 The giblets - Top to bottom, The neck ,heart,gizzard,liver & the rest is binned. 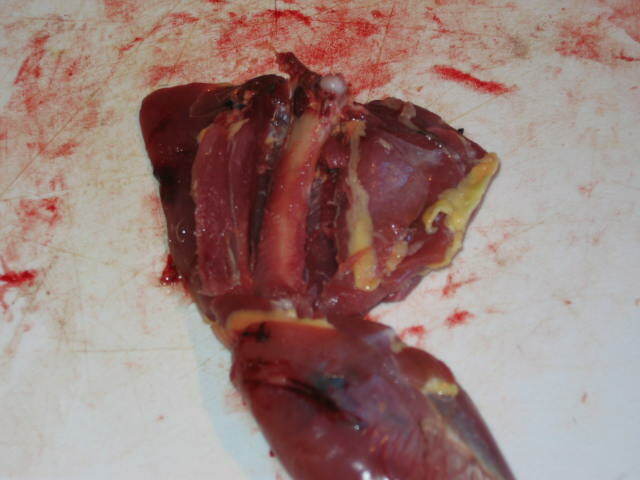 The gizzard needs some more prep.Cut it in half where my knife is pointing,there is a natural hollow and you should put the blade in here and cut.You will feel it is tough and also feel the grit which is what we are trying to empty out,it will wash out easily enough. 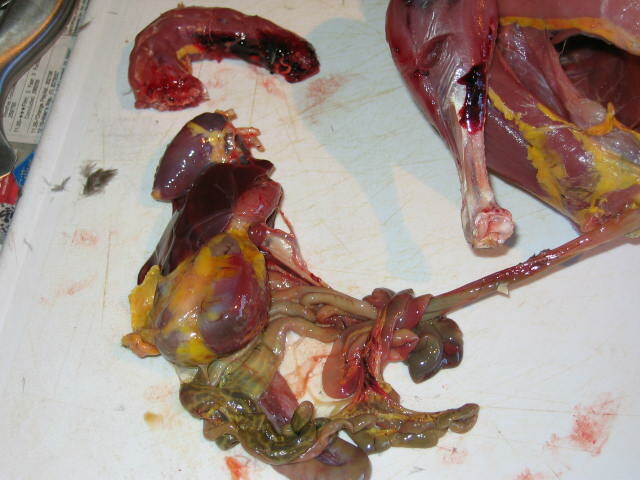 The liver should be inspected,if there are yellow spots do not use! 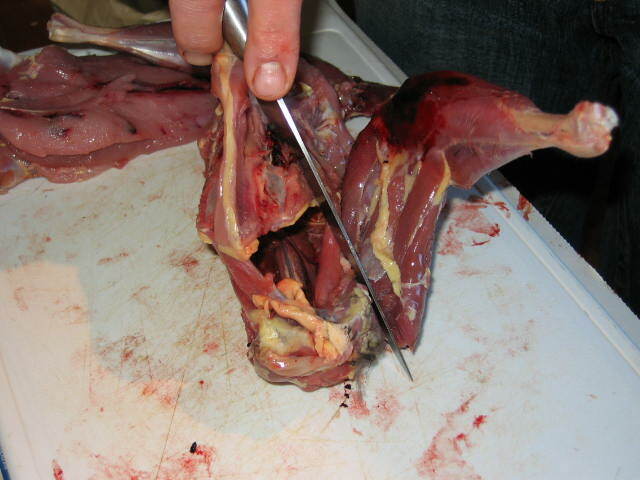 If you look where the knife is pointing you will see a blue/black sac this is the bile duct and has to be discarded with out bursting or it will taint the meat. 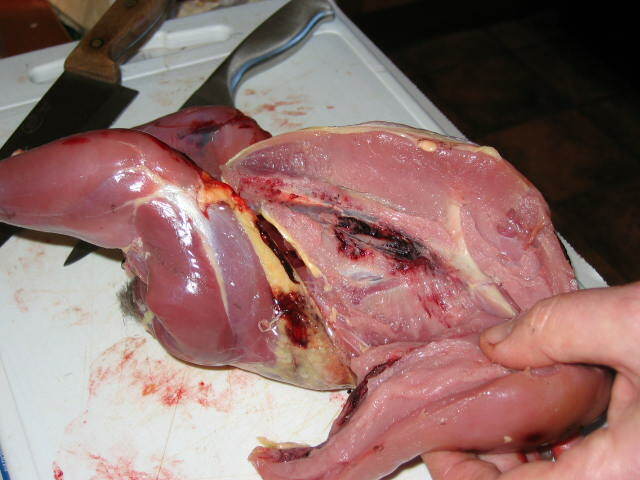 Now you have a carcase ready for cooking along with the giblets for a stock,now we can process it a bit more if needed. 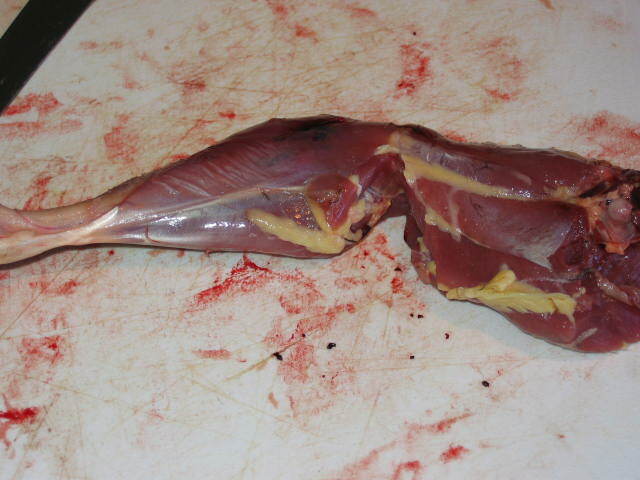 If the bird is,like this,badly shot or bruised,you may wish to remove the better bits of meat. 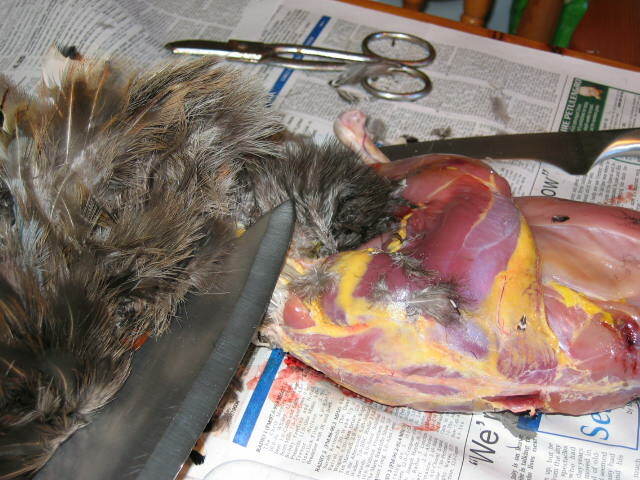 Feel for the breastbone(the yellow line on the breast)and insert your knife point there on one side until it stops,slide toward the tail and then reverse the blade and run it towards the head end. Remove the knife and insert at this angle under the wishbone. To get maximum meat slit down to the shoulder. Go back to the breastbone and follow the contours of the ribs until you have the breast off. 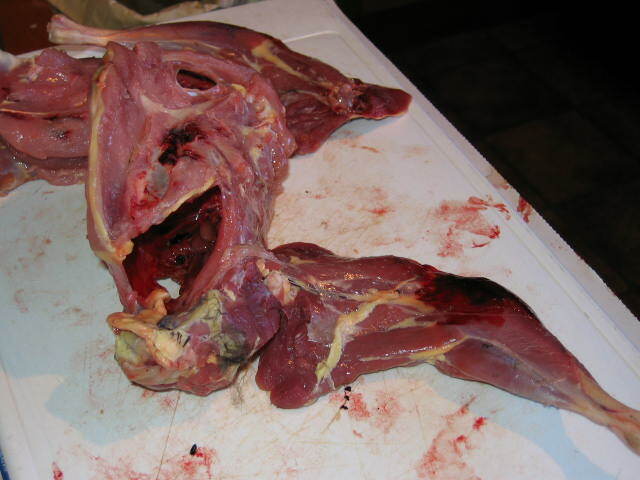 This shows the other side,the breast and wishbones with the breast steaks off. 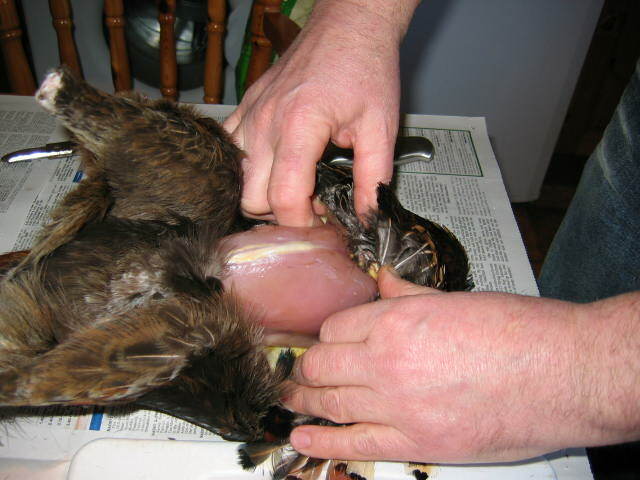 To remove the legs,lift away from the body and place the knife where the top of the thigh and hip meet and slide the knife back until it hits the thigh bone. 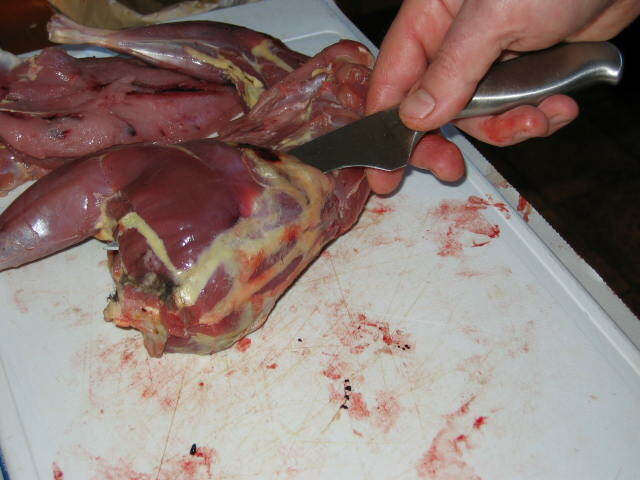 Remove the knife and slice from the back end,you will have to feel about with the knife as it feels hard at the base of the hip,then slide the knife towards the thigh bone. Push thigh away from the body and it will pop out of the socket,then cut any tendons/meat still attaching the thigh and hip. You now have(top-bottom) - a(badly)boned carcase to make stock from - breast steaks - legs. The legs,as I did not draw the tendons,will have to be further processed. To avoid the sinews cut into the natural hollow behind the knee to the bone,then continue around the thigh bone ABOVE the knee. On the inside of the thigh,feel for the bone and then cut up the same line and follow around the bone.This shows it half done. 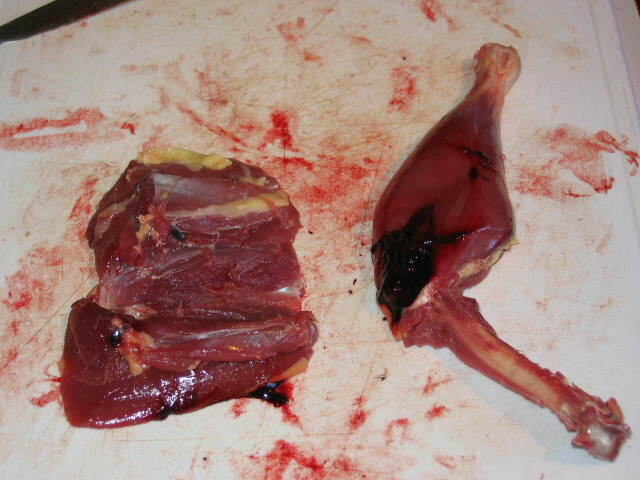 The thigh meat is great in curries or can be stuffed with pate or a soft cheese and wrapped with pancetta/parma/streaky,generally porky products. Nice job Henry, well done.